The very sudden death of Jim Flaherty evoked a sense of mortality in his colleagues that was emotionally inspiring. All of these political allies and enemies suddenly saw their own passages in Smilin' Jim's death. A man who devoted the majority of his life to politics, sometimes referred to as public service, retires and a few weeks later is gone from this earth. A whisper of time to enjoy his retirement, dying in the arms of a colleague instead of his family. As a father, I mourn his passing; as a man who has given many hours of volunteer time to high needs children, I celebrate his contributions to accessibility in sports for children of all abilities. Enlightened self-interest can bring about wonderful community centres in your riding. Jim Flaherty was also a contributing Minister in the MIke Harris regime, the downloading to the municipalities, Walkerton, Ipperwash, and, as Finance Minister under Ernie Eves, a $6 billion dollar deficit to the Province of Ontario after having assured them that all was well. 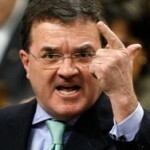 After Harris was pounded out of office in a humiltiating rejection of his far right Reform Conservative policies, Jim Flaherty fled Ontario politics with John Baird and Tony Clement to join Stephen Haper in Ottawa, clearly announcing their ideologies. Still far right Conservative Reform Alliance Party politics. 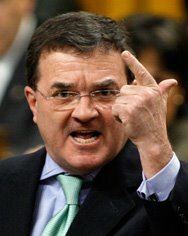 Jim Flaherty as federal Finance Minister recently supported and facilitated all of the environmental, social justice, and middle class losses that allowed the 99% poor to get poorer and the 1% rich to get much richer. He had nothing to do with Canada's ability to deal with the global economic downturn; those banking regulations had been put into effect by previous governments. It was only due to Oppostion pressure, that stimulation spending was introduced into the mix. The upcoming "balanced budget" was balanced on the backs of the middle class, environmental science, and social justice. Jim Flaherty presented the last two Omnibus Budget Bills that reversed decades of natural resources protection and environmental audits and gave the Prime Minister final veto or approval. The lighting on the CN Tower in honour of your passing was certainly not in celebration of your greening of Canada; rather, it celebrated the blarney Irish in you capable of spinning a great tale of deception while hiding the pot of gold away, far away, from the majority of Canadians. My heart as a father goes out to your family; my hands as a hard working Canadian taxpayer will not be lowering my flag to half mast. This entry was posted in Education, Environment, Politics by Skid. Bookmark the permalink.